The afternoon tea for 21st century is open to professional culinary teams from hotel, resort, restaurants and culinary schools A team should consist of 2 people - chef and food & beverage person. 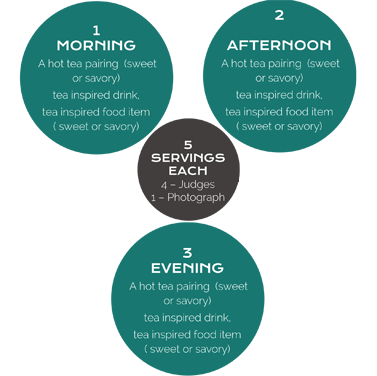 The items should match or complement the teas you have chosen to serve. 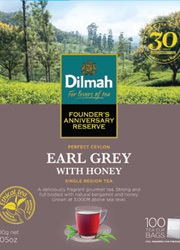 A perfect cup of straight black tea must be brewed from the Founder’s Anniversary Reserve tea selection. 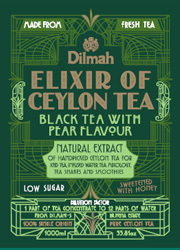 Tea infused items can be from any of the tea ranges. These items are to be brought in pre-prepared*, ready to serve. Hot items to be served hot/warm., cold items to be served cold. All 3 food items need to be different from each other. Last minute kitchen facilities will be available for chilling,heating and plating. The 4th place setting which is for photography needs to be set up separately only once the judging of your presentation is over. Recipes – the recipes for the teas & food items are also required. 4 sets each. This may be incorporated into the menu or will be provided separately. The two registered competitors are the only persons permitted to perform in the kitchen preparation and the final presentation. Only items presented in the given time frame will be considered for evaluation. 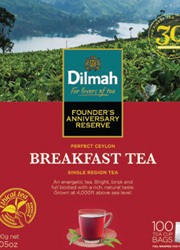 3 weeks prior to the competition Dilmah tea trainer will conduct a fast track tea training course for all participants. An energetic tea. Bright, brisk and full bodied with a rich, natural taste. Grown at 4,000ft above sea level. 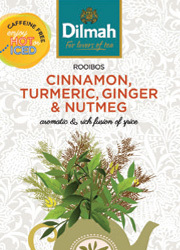 A deliciously fragrant gourmet tea. Strong and full bodied with natural bergamot and honey. Grown at 3,000ft above sea level. 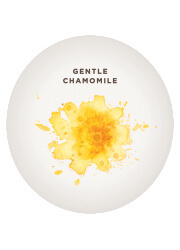 A serene, soft and gentle tea infused with natural lychee and ginger flavours. Grown at 5,000ft above sea level. 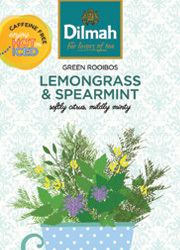 A sweet, minty fragrance and bright amber liquor introduce a deliciously refreshing natural infusion. 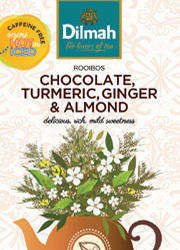 The lightly nutty flavour of Rooibos is elegantly extended by a fresh, sparkling mint and next a spicy, ginger note. A gingery finish with highlights of mint linger pleasurably. A deep red liquor with the fresh, fragrance of grapefruit and lemon unveils an explosion of berry flavours and a refreshing finish with light rose and citrus notes. Sweet citrus and mint aromas are the prelude to this gentle infusion that hides a sparkling surprise. 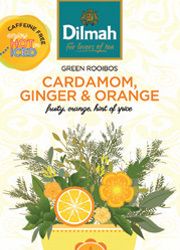 Orange and Lemon dominate, yielding to a sparkling mintiness that leaves the palate cool and deliciously refreshed. 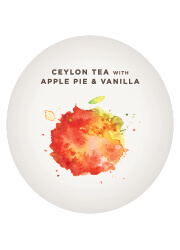 Apple pie in a cup, with a bright and brisk Ceylon BOP with Apple, Cinnamon and creamy Vanilla notes. 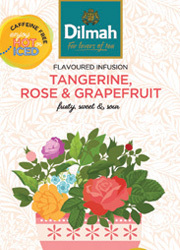 A comforting tea with a gentle fragrance and deliciously fruity personality. 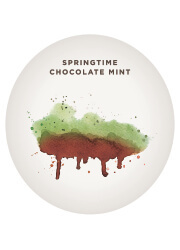 Black tea gently fused with chocolate flavour and peppermint leaves. Makes the perfect after dinner tea. 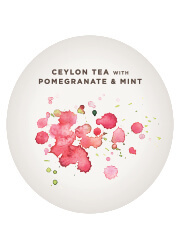 Naturally sweet Pomegranate and Mint, enhances the flavour of this medium bodied Ceylon Tea with the unusual flavour of Pomegranate, tart and tangy, enlivened with Mint. A refreshing and gentle tea. 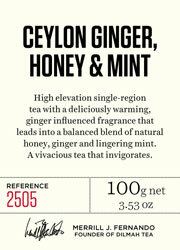 A beautifully rolled Oolong with light, bright and elusive natural floral note, subtly complemented by natural Ginger. Intense aroma with the infused leaf yielding orchid and spice notes. In the cup the Ginger emerges gradually, with a light warming effect, and settles comfortably with the floral note in the light Oolong. 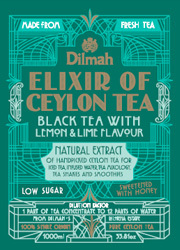 Delicate and delightfully different, a light tea with a mild, spicy secret, perfect at any time of day. 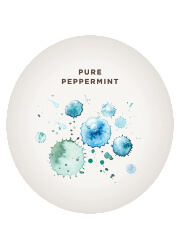 This Pure Peppermint infusion is naturally caffeine free and ideally enjoyed after a meal, to cleanse the palate and aid digestion. The natural peppermint oil in the leaves imparts a menthol aroma and adds sparkle to the infusion, making it a cooling and energizing experience. 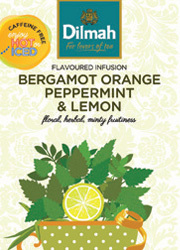 Try the infusion of Peppermint leaves with a touch of honey, as a mild and delicious accompaniment to your day. 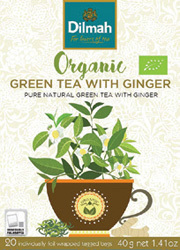 A beautiful combination of a lightly piquant ginger root with a gentle organic green tea. 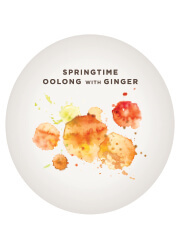 The mildly spicy ginger evolves into a delicious and palate cleansing brew that is best enjoyed pure and natural. Add a light honey for sweetness if desired. 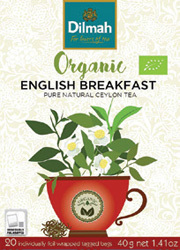 Rich and full bodied organic Ceylon Tea brews a great start to the day. 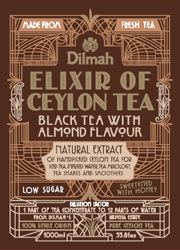 This is a bright and intense gourmet black tea that can be enjoyed pure and natural or with milk. 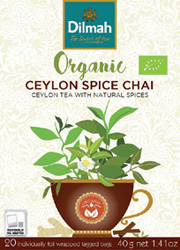 A gentle Chai, combining tea and natural Ceylon Spices in a complex and piquant natural chai of tea, cinnamon, ginger, clove, pepper. Best enjoyed natural and for a classical milky chai, use two teabags and brew 6 minutes before combining with warm, dairy milk or condensed milk. High elevation single-region tea with a deliciously warming, ginger influenced fragrance that leads into a balanced blend of natural honey, ginger and lingering mint. 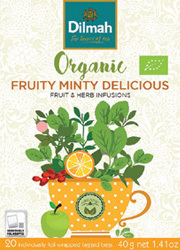 A vivacious tea that invigorates. 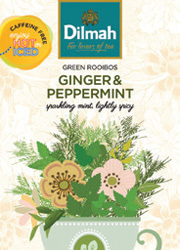 This aromatic blend of young Hyson green tea and peppermint leaves is naturally uplifting. 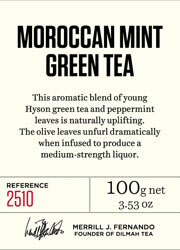 The olive leaves unfurl dramatically when infused to produce a medium-strength liquor. 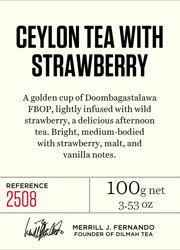 A golden cup of Doombagastalawa FBOP, lightly infused with wild strawberry, a delicious afternoon tea. Bright, medium-bodied with strawberry, malt, and vanilla notes. 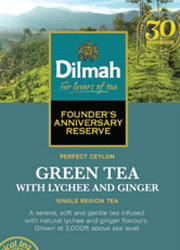 Organically grown Daejak green tea with curled green leaf. 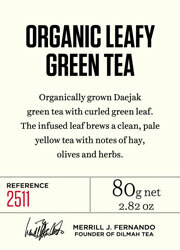 The infused leaf brews a clean, pale yellow tea with notes of hay, olives and herbs. 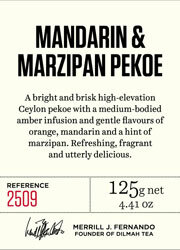 bright and brisk high-elevation Ceylon pekoe with a medium-bodied amber infusion and gentle flavours of orange, mandarin and a hint of marzipan. 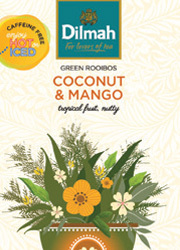 Refreshing, fragrant and utterly delicious. 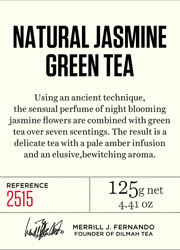 Using an ancient technique, the sensual perfume of night blooming jasmine flowers are combined with green tea over seven scentings. 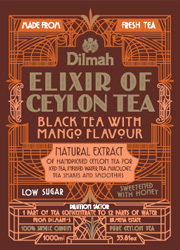 The result is a delicate tea with a pale amber infusion and an elusive, bewitching aroma.